Samford University's online Master of Healthcare Administration provides a competency-based curriculum that prepares students to lead in healthcare organizations. Samford University's online Master of Healthcare Administration provides a competency-based curriculum that prepares students to lead in healthcare organizations. The curriculum is designed to provide mastery in communication, leadership, professionalism, business knowledge and healthcare systems competencies as well as a competitive edge in project management and quality improvement. The Master of Healthcare Administration is an online, five-semester program that culminates with a capstone project and internship. Obtain student copies of your college transcripts to assist you in completing the coursework section for the application. You will need a transcript from every university attended. Create an application account at HAMPCAS. Once the account is created, an instruction manual can be found under the “?” icon on the top right of the page. 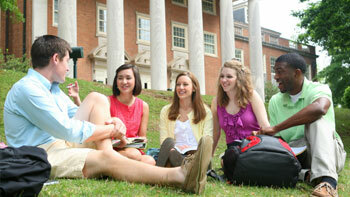 The HAMPCAS system simplifies the process of applying to Samford programs. Compete one application and send it along with other information to our centralized service. The HAMPCAS system will verify your application for accuracy, calculate your GPA and send your materials to the Master of Healthcare Administration admissions department. Request official transcripts from each institution attended by using the transcript request form located in the application. Complete the form, submit it to the registrar's office of each institution attended and instruct them to enclose the form with your official sealed transcript. Transcripts must be sent to the HAMPCAS Transcript Department. The HAMPCAS system only accepts official transcripts sent directly from the registrar's office. Please send transcripts as early as possible and no less than four to six weeks before the application deadline due to the time needed to verify your application. Pay the initial service fee of $115 when submitting the HAMPCAS application. The references should attest to the applicant's academic ability and potential. Submit official test scores to Samford University – Code: 1302. An invitation to complete the video interview will be sent once the application has been received in the Graduate Enrollment office. Possess a baccalaureate degree in any field from a regionally accredited college or university. Must also currently work in healthcare or have at least 3 years of prior healthcare experience, and have a B or better in an accounting course and statistics course. Have a minimum overall GPA 3.0 on a 4.0 scale or a minimum 3.2 GPA in last sixty (60) hours of undergraduate coursework. An applicant who does not meet the GPA requirement must submit a GRE score taken within the last five years demonstrating a minimum earned score of: Verbal 153; Quantitative 144; Analytical 4.0. Submit three letters of reference through the application system. At least one reference must be from a work supervisor or manager and one from a current/previous professor. International applicants or American citizens who learned English as a second language must score at least 550 (paper), 213 (computer) or 80 (Internet) on the Test of English as a Foreign Language (TOEFL) or 6.5 International English Language Testing System (IELTS) Score. We cannot issue an I-20 for this program at this time. Submit a video interview. A link will be provided upon submission of the application. Have completed health and immunization forms on file in the Health Administration department. Submit proof of health insurance while enrolled at Samford. Test negative on drug screens and pass background checks. Maintain a cumulative GPA of 3.0 or above on all coursework. Make no more than two C’s in any graduate course. Note: Students may only re-take a course once to earn a B or better grade. Retaking a course may cause an interruption in the students’ matriculation in terms of scheduling courses. A student who fails to earn a B or better grade when retaking a course to replace a “C” grade will be dismissed from the program. A student who fails to successfully complete a required MHA course within one calendar year of academic probation notification will be dismissed from the program. Students must be aware that any violation of the Healthcare Administration Honor Code may result in immediate dismissal from the MHA Program. Students must maintain an overall 3.0 or higher GPA. Students who fail to maintain a 3.0 GPA will be placed on academic probation. Students who remain on academic probation for more than two semesters will be terminated from the MHA program. Students must possess a 3.0 GPA overall to earn a Master of Healthcare Administration degree. Students retain the right to appeal termination decisions via the grievance procedure outlined in the Healthcare Administration Student Handbook. Perform acts of service that demonstrate a commitment to Christian values and principles. Every aspect of the M.H.A. experience is designed to provide students with a sound foundation in competencies needed by any healthcare leader through both in-class and out-of-class environments. Students are required to complete an internship to practice not only using the knowledge, skills and competencies but to also refine and hone them as well. The internships will be designed in an effort to suit students ultimate career goals. The experience could be in any setting including small group practices, hospitals, insurance companies, public health departments, consulting firms, etc. Because the desired path of every student will be different no two internship experiences will be identical; however, every student will receive the same opportunity to customize the experience for maximum benefit. Samford University has notified the Commission on the Accreditation for Healthcare Management Education (CAHME) of its intent to seek accreditation for the M.H.A. program upon meeting the eligibility requirement of having graduated at least one classes. Samford University is accredited by the Commission on College of the Southern Association of Colleges and Schools.